Applied Health Economics and Health Policy provides timely publication of cutting-edge research and expert opinion from this increasingly important field, making it a vital resource for payers, providers and researchers alike. The journal includes high quality economic research and reviews of all aspects of healthcare from various perspectives and countries, designed to communicate the latest applied information in health economics and health policy. While emphasis is placed on information with practical applications, a strong basis of underlying scientific rigor is maintained. 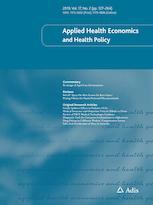 Applied Health Economics and Health Policy offers a range of additional enhanced features designed to increase the visibility, readership and educational value of the journal’s content. Each article is accompanied by a Key Points summary, giving a time-efficient overview of the content to a wide readership. Articles may be accompanied by plain language summaries to assist patients, caregivers and others in understanding important medical advances. The journal also provides the option to include various other types of enhanced features including slide sets, videos and animations. All enhanced features are peer reviewed to the same high standard as the article itself. Peer review is conducted using Editorial Manager®, supported by a database of international experts. This database is shared with other Adis journals.